ARKDIS project was a co-organiser of this year's Computer Applications and Quantitative Methods in Archaeology Sweden (CAA-SE) conference in Lund in December 2-4, 2013. We were altogether over 60 participants and had an interesting programme for three days. During the first two days we had paper presentations and two keynotes given by Philip Verhagen (Vrije Universiteit Amsterdam) and Sofia Pescarin (CNR ITABC). Philip discussed least cost path modelling and different aspects of travelling using two case studies from Low Countries and Cappadocia showing that there is plenty of work to do in this rather long-researched but highly under-theorised area. Sofia's talk gave a broad overview of the notions of virtual museum and various aspects pertaining to the the public presentation of archaeological virtual realities. The third day was reserved for a visit to Lund University Design Centre and Humanities Lab where the conference participants had an opportunity to acquaint themselves with the current projects of the Humanities lab. The programme had a good spread of papers from senior researchers, doctoral students, professionals and master's students. Similarly, thematically the conference covered all covnetional CAA-themes from quantitative methods and GIS to 3D and data management and public presentations of archaeology. From my own point of view, it was interesting to hear updates from Marcus Smith from the National Heritage Board on the Digital Archaeological Processes Programme and Ulf Jakobsson on the work on the Swedish National Data Archive and their work on the archiving of archaeological research data. Other highlights were the 3d data capture and modelling related presentations given by the master's students of Lund University that really opened the technical issues related to capturing of 3d data and gave a promise of the diffusion of these methods to become a part of the everyday work practices of archaeologists in the future. Bodil Petersson from the ARKDIS project discussed her and Carolina Larsson's work on exhibitions and exhibiting archaeology in collaborations with Kivik museum and in general the different aspects of combining art and communication of archaeology. One of the interesting observations of the presentation was the question whether artists and designers should be involved in the archaeological fieldwork already in the beginning of the investigation process rather than only after the archaeologists have in practice handed over their documentation to a museum. Another ARKDIS presentation was given by Per Stenborg who discussed the implications and consequences of digital presentations. He presented a number of interesting questions on the capabilities of digital surrogates to replace physical artefacts and sites, and for instance their implications for the repatriation debates. A significant aspect of these types of questions is that they really help to understand the nature and role of digital surrogates, the significant aspects of cultural heritage objects and how they can be vastly different for different individuals and groups. The 18th incarnation of the Conference on Cultural heritage and new technology (CHNT18), earlier in its prehistory known as workshop Archäologie und Computer had several tracks, but somehow it seemed that the two main themes that have been prevailing for the last 15 or so years are still going strong: 3D and data management. In some sense we are still discussing about how to create impressive (both technically and visually) models and representations of archaeological entities and presenting yet another open and "open" (relational) database solutions for the documentation of archaeological data of which the latter ones tend to be geared either toward heritage management or documentation needs of individual projects or institutions. Apart from ARCHES project and ARIADNE infrastructure related session, there is very little concrete talk about preservation. Even if there might be some reason to be a bit cynic, the field is progressing. The use of 3D for research purposes, quick capture and processing of data for specific rather than "this might be somehow useful" -purposes, and development of data management for actual (albeit sometimes narrow) needs of researchers and heritage managers are something that wasn't discussed too much for some years ago. Also the whole focus on research infrastructures and the acknowledgement of (at least in principle) the benefits of open and well-documented data is something that is quite laudable even if many obstacles are still on the way to a large scale deployment of interoperable infrastructures. Further, a significant aspect is the interest and initiative of major regional and national authorities on these initiatives instead of individual geeks (as was the case for a decade ago) interested in such metaphysical things as data and information management. The fact is that an infrastructure is not sustainable without a backing of the responsible authorities, either directly as their owners or committed sponsors of broader international and/or community efforts. 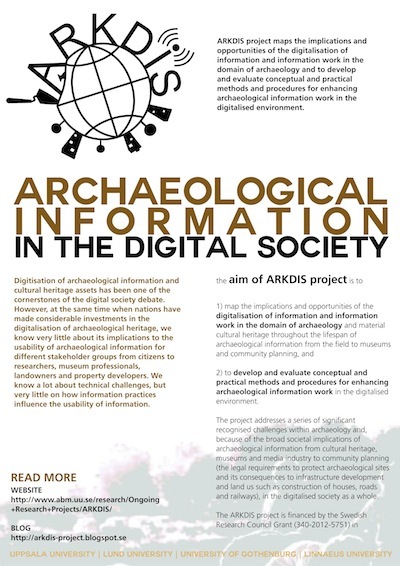 The ARKDIS project participated the event with a poster and a presentation by Isto on the aspects of determining documentation and authenticity of archaeological entities on the basis of a study of how archaeologists interpret a ball-point pen as if it would be an archaeological object. Archaeological Information in the Digital Society (ARKDIS) Research Project organises an open lecture by Dr. Nicolo Dell'Unto (Lund University) and Dr. Daniel Löwenborg (Uppsala University) titled Examples of archaeological 3D projects in Uppåkra, Catalhöyuk and Gamla Uppsala on Friday 27 September, 2013 at 13.15-14.00 Room 2/K1024, English Park Campus, Uppsala University. ARKDIS project was presented at the ASIS& European Workshop 2013 in Turku, Finland last week. The workshop was second European research conference of the European Chapter of the Association for Information Science and Technology and was organised by Information Studies, School of Business and Economics, Åbo Akademi University in collaboration with the Department of Arts and Cultural Sciences of the Lund University. starting date August 1, 2013 at the earliest, latest on January 1, 2014. Education at the doctoral level consists of 4 years. The position is financed with a doctoral studentship (doktorandanställning). Doctoral students are expected to pursue their studies full-time and actively take part in the department’s activities. Departmental duties (typically teaching and administration) at a level of at most 20% can be included in the position. Qualifications required: Applicants must have a Masters’ degree in library and Information Science, archival science, museology and cultural heritage studies or a corresponding degree in a nearby field. For regulations, see Uppsala University’s guidelines for doctoral studieshttp://regler.uu.se/Rules_and_regulations_in_English/. Research work demands close collaboration with Swedish archaeologists and an ability to read Swedish language texts. An applicant is therefore expected to have a working capability to read Swedish and orally communicate in Swedish/Scandinavian. Application: Applications should include a short CV and a research plan (max 4 pages) that complies with the general area of the research project described above. 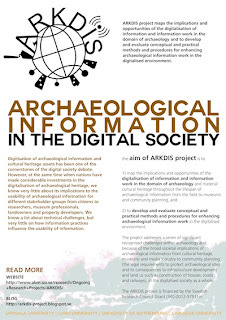 The purpose of the research plan is to give the applicants an opportunity to formulate and present a personal draft proposal of a possible doctoral research project in the general area of the Archaeological information in the digital society research project. (For additional information, please contact project director Isto Huvila, contact information see below) The research plan must contain a tentative heading, short presentation of the subject area and the proposed focus of the research, a short overview of selected relevant earlier research, and theoretical frameworks and methods to be applied and include a preliminary timetable for the 4 years period. The applicants Masters' thesis and degree certificate and diploma supplement (examensbevis) must be included in the application together with other relevant documentation e.g. publications. The selection will primarily be based on the research plan. Earlier publications are regarded as merits. For further information please contact Christer Eld, Head of Department,christer.eld@abm.uu.se (+46 18 471 3388), Associate Professor Isto Huvila, Project Director, isto.huvila@abm.uu.se (+358 40 572 6259) Professor Kerstin Rydbeck, Director of postgraduate studies, kerstin.rydbeck@abm.uu.se, (+46 18 471 7978) or Malin Sigvardson, Faculty Director of Studies,malin.sigvardson@uadm.uu.se (+46 18 471 1879). Trade-union representatives are Anders Grundström, Saco (+46 18 471 5380), Carin Söderhäll, TCO/ST (+46 18 471 1997) and Stefan Djurström, Seko (+46 18 471 3315). You are welcome to submit your application no later than April 30 2013, UFV-PA 2013/800. The Swedish partner of the ARCHES project, the Swedish National Heritage Board (RAÄ) organised today a workshop on archaeological archives and archiving in Stockholm. The workshop gathered 25'ish participants from the heritage board, National Historical Museums, county administrations and museums and universities -- in the last group me and a colleague from Umeå. The aim of the workshop was to discuss a draft of a core standard for archaeological archives in Europe and its application and applicability in Sweden. Even if the crowd was undoubtedly highly biassed in its interest in the management of archaeological data and documentation, it was still somewhat surprising how unanimous we were on the central challenges, problems and strengths of current archaeological practice in Sweden. The draft proposal we discussed was not entirely unproblematic. Its level of abstraction varied from overarching formulations to highly detailed instructions that were largely based on current, and in some cases, past practices. Also, especially in the sections on digital documentation, it was apparent that the proposed measures were based rather heavily on analog archival practices, and in general, the division of sections to analog documentation, finds and digital documentation can be seen as somewhat outdated. At the same time, however, the draft served clearly as a good propeller of discussion and helped to articulate both current issues and possible measures to counter them. The unclarity of administrative responsibility between different authorities and the lack of digital infrastructure for the management of digital archaeological data were two apparent challenges together with a bunch of other things that would need to be solved in the near future, or as some of the participants noted, around 15 years ago. As a whole, the workshop was an excellent event and I am already waiting for the updates on the ARCHES project and continuation of today's discussion in Sweden in general. As a researcher of information work, it was impossible not to remark that many of the current problems go back to the clash of tacit conceptualisations of archaeological work in terms of analogue and public authorities' driven practices and the contemporary realities of public management and the digital technology. Therefore, it was not at all surprising that doing something would probably require an extensive discussion on concepts and how they could and should be defined today. At the end of the workshop, Britta Rosborg and Marcus Smith presented two on-going efforts to do some work on revisiting and redefining, Britta on the deposition procedures of archaeological finds in Sweden, and Marcus on the RAÄ's year old ambitious project on the Digital Archaeological Production Chain (DAP).